Google has signed a partnership with the world’s biggest car group, the Renault-Nissan-Mitsubishi Alliance, which will see Android OS power the media displays from 2021. Car manufacturers have long resisted the overtures of Google, preferring instead to develop their own operating systems, satnav programs and entertainment platforms. There is a big fear in the industry that Google is seen as a competitor and that the company could harvest data. However, many drivers prefer to use Google’s Android OS by connecting their mobile phones to bluetooth systems, which allow drivers to access Google Maps and other popular Android apps. Google, Apple and Amazon have long battled for the hearts and minds of the motor industry, and just this week the new Audi e-tron SUV was revealed to be complete with Amazon’s Alexa Auto Software. But it is the Google partnership with the Renault-Nissan-Mitsubishi group that will affect the most cars, together they sold 10.6 million cars last year. 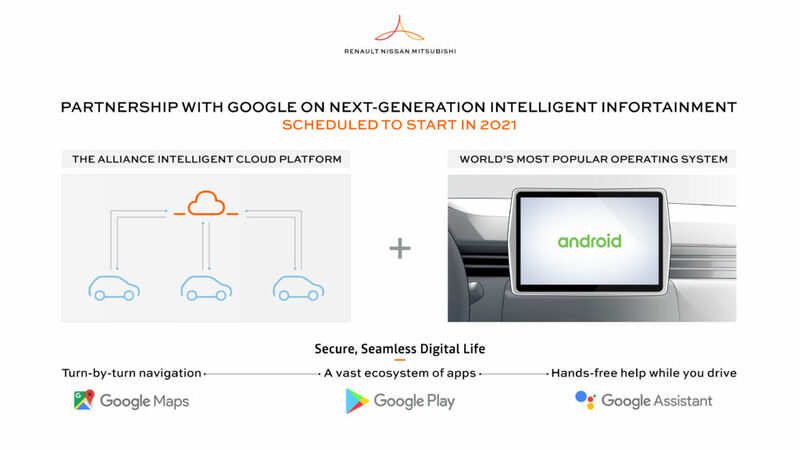 The Alliance’s Global VP of Connected Vehicles, Kal Most said: “With the integration of the Android platform into our infotainment systems, we are adding a new level of intelligence to our connected vehicles.